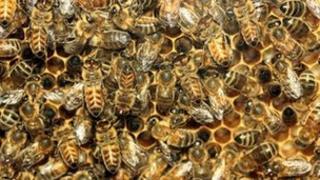 A highway in the US state of Utah was temporarily closed after a lorry carrying at least 20 million bees overturned, freeing the insects. The bees were being transported to California, ready to pollinate an almond crop next spring. Interstate 15 was closed down for several hours while local beekeepers worked overnight to recapture the bees. The trip was among the last of 160 truckloads of bees being sent south from Adee Honey Farms in South Dakota. Authorities closed the southbound lanes of the highway, near the Arizona border, for several hours on Sunday night. The road reopened early on Monday morning, but officials have warned drivers to keep their windows closed. "The driver lost control, hit the concrete barrier and rolled over," said Corporal Todd Johnson of the Utah Highway Patrol. "Of course, we then had bees everywhere." Driver Louis Holst and his wife Tammie were dragged out of the overturned trailer by first responders, but were swarmed by the escaped bees on the highway. "We just started swinging our clothes," Mr Holst told the Associated Press news agency. "They stung her all up and down her neck." Mr Holst said he was stung about a dozen times and suffered a gash on his forehead. His wife also was both stung and bruised. Two police officers were also stung. Richard Adee, owner of Adee Honey Farms, said this truckload, worth approximately $116,000 (£72,500) was "pretty much a complete loss". Local beekeepers worked overnight to capture the bees, but on Monday most of the inhabitants of the 460 hives were gone or dead. "We tried to move them [the bees] as far out of the metropolitan area as we could," beekeeper Melvin Taylor told the Reuters news agency. "Because when those bees come alive today, they are going to be mad that their house is all [broken] apart." Earlier this summer, an estimated 14 million bees escaped from an overturned truck on a Idaho highway.